Don’t want to spend money on containers to organize things? 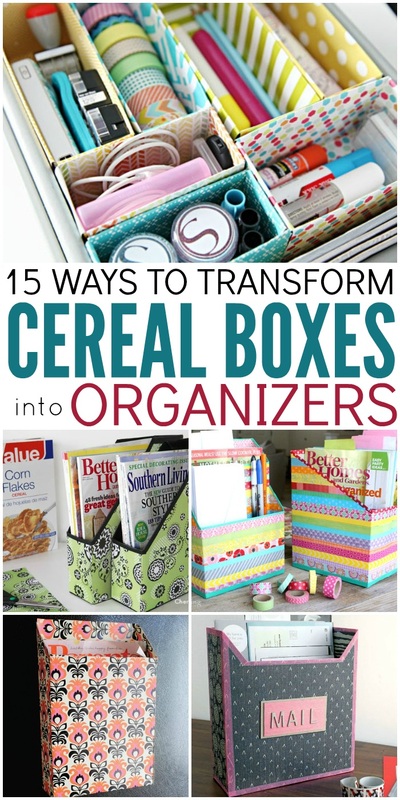 Turn those cereal boxes you throw away into organizers! Check out! Want to get things organized but don’t want to spend much on containers? You’re in luck! You have some free and fabulous organizers right in your kitchen. You might be saying “What? Where they are?” Well, your cereal boxes! You’ll be amazed at what you can make with an ordinary cereal box. With a little tape, glue, paper, and fabric, you can turn a free cardboard box into a beautiful organizer for your home. Make a magnetic paper bin for your fridge to hold your kids’ artwork, important numbers, menus, or anything else you need to keep handy in the kitchen. These gorgeous magazine holders are going to look amazing on your shelf. Great way to eliminate those stacks of magazines on your tables. Say goodbye to messy drawers! Decorated cereal boxes make perfect drawer organizers. Visit OneCrazyHouse to read the full post.